Paying The Bill: How Much Is Your Attorney Charging You? - Johnny W. Thomas Law Office, P.C. So, you’re facing a legal problem and you don’t want to hire an attorney because you are afraid hiring an attorney will be expensive? Though there are a few tips when it comes to hiring an attorney that fits your budget, attorney billing can become stressful when you don’t understand exactly what you are paying. In this article, let’s break down the three main fee structures attorneys use when handling legal matters. When hiring an attorney you should always know how you will be charged for their services. The key is to find an attorney with a billing method that works for you. Attorneys traditionally use the hourly billing structure for most legal matters. Using this structure, the attorney tracks the time they spend on your case and bill you according to their hourly rate. This usually tends to be the most expensive billing structure for you, the client, and may lead to uncertainty to just how much you will actually have to spend for legal services. However, it may be necessary for an attorney to use this structure to account for the unexpected. 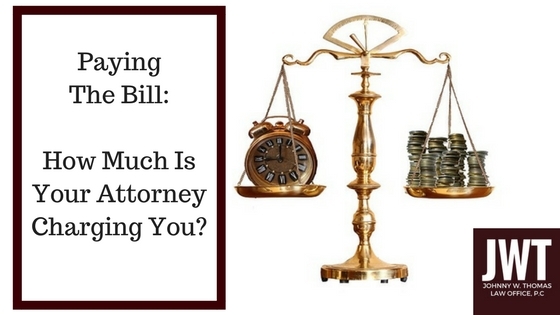 When billed at an hourly rate, most attorneys will require payment of a fee up front. This is known as a retainer amount. The retainer amount will be placed in a special bank account for the client (trust account) and the attorney will withdraw from this account as time is spent on the case. You will likely be required to pay a large retainer fee upfront in order to hire the attorney and for the attorney to begin working on your case. Once the initial retainer is paid, the attorney can begin to work on your case. You should receive periodic invoices detailing the time spent on your case. Once the retainer dips below a certain amount, the attorney may ask you to replenish the retainer amount before continuing work on your case. As both a benefit to the attorney and the client, more and more attorneys are using flat rate fees for routine, uncontested matters. Using this structure, the attorney will quote you a flat fee amount to handle your legal matter fully. Usually, attorney’s who use this method may handle this type of matter often, have an accurate idea of how much time will be needed for resolution. The flat fee is an estimate of how much time would have been billed if an hourly rate was used. This method is usually beneficial for the client because there is no uncertainty when it comes to how much money will be spent for legal services. If your attorney uses a flat fee structure, you may be required to pay the entire amount before the attorney begins work. Once the fee is paid, you will not have to worry about any additional expensive bills for legal work inside the scope of representation. A contingency fee structure allows the client to pay nothing and the attorney to receive all fees from case settlement or court judgment. This method is usually used in personal injury cases and is often advertised by personal injury firms in the media. Attorneys who use this method establish a percentage that will be paid with settlement or judgment funds once the case is concluded. This fee structure is beneficial for clients since it allows them to hire an attorney to handle their case without paying money from their own pockets. It is important to know, that when this fee method is used, attorneys take their fee first before medical bills and expenses are paid. If there is money remaining after attorney’s fees, expenses, and medical bills have been paid, that amount may be given to the client. Attorneys may use a mixture of two different fee structures. Cost of expenses - such as filing fees, service fees, etc. - are not included in attorney fee. Costs of expenses are usually billed separately. Remember, you should NEVER sign an attorney employment agreement you do not understand. Before signing on the dotted line, make sure you ask questions and understand just how you will be charged for the attorney’s services. If the answer doesn't work for you, find an attorney that uses a billing structure that does.